TapTop is a simple, addictive $1 board game from Versal Labs. While TapTop looks are plain, it will keep you tapping for hours. In spite of some potential repetitiveness and a seemingly undemanding start, TapTop quickly develops into an increasingly challenging and addictive game. While it looks simple, TapTop quickly becomes a real taste of agility, reflexes, and timing. A variation on the classic “Simon Says” concept, TapTop tests your ability to quickly pop a set of small, multi-colored balls before time elapses. 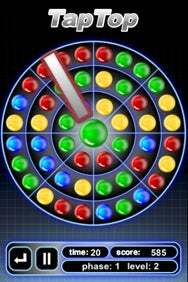 The catch is that you have to pop balls that are consistent with the color established by a larger, central ball—which changes color randomly. Each incorrect pop subtracts points from your total score. You can change the color of the center ball at any time by tapping on it, which is a distracting option at first, often causing you to lose time tapping until you get the color you want. However, the ability to change the chief ball’s color becomes an important asset as you hone your timing and progress to more difficult levels. With each level you pass, the obstacles encountered get trickier to dodge. Rotating metal bars, wood, and glass appear with increasing frequency and complexity, seemingly going to great lengths to impede your smooth, color-coordinated tapping. TapTop’s challenges make it a fun combination of race-against-the-clock madness and patience, requiring you to maintain enough speed to finish each level, but enough poise and concentration to pop efficiently and sequentially. Speed and efficiency are definitely key if you hope to see the finish line. The game offers 49 levels, which quickly intensify as you advance. When the game starts, six of the seven stages are locked, and you unlock each stage by completing the previous one and collecting sufficient points. At the end of each stage, which consists of six levels, there is a final, seventh, challenge. The revolving wooden and glass obstacles are at their most elaborate in these challenges, so beware. TapTop has an intentionally simple and straightforward gameplay experience and clean, basic graphics. It is a board game, after all, and Versa Labs seems intent not to wow you with pretty visuals, but instead keep you glued to the screen with the escalating challenges at hand. As a result, the game’s feel is not unlike a modern arcade game, especially when you factor in TapTop’s goofy sound effects. The audio, which includes a silly “popping” noise when you tap the correct ball and various cartoon-ish “boings” when you tap incorrectly, are charming and entertaining at first. However, the longer you play, the higher the annoyance potential becomes. Furthermore, the game’s strict timer appears intent on dooming your every advancement, and the warning toll that begins with ten seconds remaining and ticks with increasing intensity and speed until the end. Inevitably, the noisy timer turns you into a jumpy tapper on the edge of your seat — and nearly on the brink of a coronary. Though the overall visual and audio style can become repetitive, and there is no multi-player option or special features yet; in the end, you are too addicted to notice. The simplicity and uniformity of the design and gameplay are rightly geared toward one thing: giving you a challenging test in agility that will keep you tapping and bubble-popping until the cows come home. TapTop is only a $1, and there is a lite version if you want to test it out before buying.